Emotions can run high after mistakes, particularly in competitive, high-level soccer games. As a coach, how you react after a mistake, such as with disappointment, can cause players to be more careful or tentative in the future or just get upset. If your forward sees you frustrated after a missed scoring opportunity, that only causes your player to become hung up on their mistake. Display composure yourself so the athlete learns by observation how to deal with adversity. Do not attempt to coach the athlete under the umbrella of anger or frustration. Wait until you calm down before giving instructions. Save your instruction for the next break in play when you and the player have both cooled off. Your reaction to a mistake may be to reprimand the player, but that may only lead to deflating his confidence further. An athlete needs to know that you still have confidence in him after a mistake. Understand what motivates each of your athletes after they make a mistake. Confidence can be fragile for many athletes, while others might respond to yelling form their coaches. Dwelling on the error only serves to make you more frustrated and upset. Let the missed goal go – it’s in the past, you can’t change what happened. And to do your job well, you need to focus on the next attack or strategy. Tell your player what you want him to do instead of what you don’t want him or her to do again. 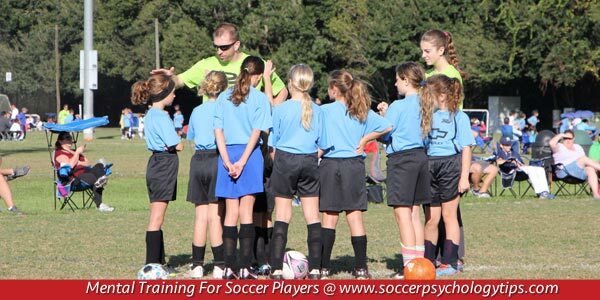 To help your soccer players develop composure, teach them the 3 R’s, which stands for: Recognize–Regroup–Refocus. When frustration, anger, or dejection is affecting one of your players, this tells us the athlete is dwelling. Half time is an excellent time for soccer players to regroup and get ready for the next half. The first step is to Recognize your athlete is dwelling on the missed shot or clearance. The next task is to Regroup by interrupting the chain of thought. And the last step and most crucial is to Refocus on the next play. We want athletes to ask themselves the following question: “What do I need to focus on right now to do my best in this next half?” The answer helps to refocus the person on the task-relevant cues for the next play. A team atmosphere in which players support each other after a setback is a mark of a cohesive team. For an attacker who is hanging his head after a missed shot, it means a lot to that player when the team members show their support and stay positive. Ask the team members to commit to showing their confidence in their teammates after a mistake or setback. Your players need to know that their team members are behind them and have confidence that they can get the job done.